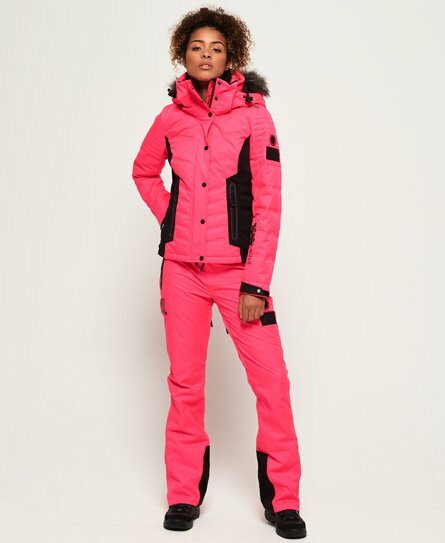 Superdry women’s Snow Pant. Designed for the slopes, these Snow pants feature a zip and popper fastening, waist adjuster straps and two front zip fastened pockets to keep your keys and phone safe. The Snow Pants also feature two back pockets with popper fastening, zip fastened thigh vents for breathability and zipped hems with hook and loop fastened boot gaiters. These snow pants are made with a water resistant fabric, as well as coated zips to ensure you stay as dry as possible on the slopes. The Snow Pants are completed with a Superdry logo on the right leg and two Superdry Snow badges on the left leg.